Suamico, WI (October 30, 2017) – N.E.W. 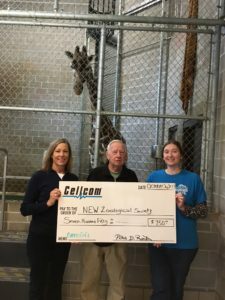 Zoological Society has been selected as a 2017 Cellcom Green Gift recipient. The organization received a $750 Green Gift from Cellcom to support new interactive graphics at the Giraffe Discovery Center. The interactive graphics will allow the zoo to educate visitors and connect with them on a new level. Young children especially need to feel, touch, and play in order to learn, and that is what the new signs hope to accomplish in the Giraffe Discovery Center. With support from the Cellcom Green Gift, the NEW Zoo hopes to have the display installed by spring 2018. N.E.W. Zoological Society was among 30 green organizations that received a share of the $40,000 in Green Gifts from Cellcom this year. The Green Gifts program launched in 2010 and uses funds generated from Cellcom’s cell phone recycling program to fund green nonprofit initiatives. Customers and community members can bring in their old or unwanted phones to be reused and recycled. Cellcom sends the phones to recyclers who in return send money to Cellcom for the materials that were saved from the phones. Cellcom’s Green Gift program completes the green cycle that starts with consumers being environmentally-conscious and donating their devices. “Our service area is fortunate to be teeming with non-profits that are creatively using their resources to help the environment though education and activism. Donating your phone allows us to contribute to their efforts through our Green Gifts program and ultimately work toward a greener tomorrow,” said Brighid Riordan, director of public affairs and customer experience initiatives at Cellcom. Cellcom is proud to support organizations of all sizes, whose work is impacting the community and building a greener tomorrow. The company’s recycling program has generated $306,975 for local charities over the past 13 years. Cellcom is an innovative wireless company that provides nationwide service for its customer base throughout Wisconsin and Michigan, with more than 50 retail and agent locations. Cellcom is respected for its long-standing reputation of delivering extraordinary customer care, being a strong community partner, and for its renowned network, which is customized to its rural markets. As a subsidiary of Nsight, Cellcom is part of a family of companies offering complete telecommunications services. Just like us, our animals require regular health care checkups, and on occasion, serious medical attention. The Cornerstone Animal Hospital fulfills that need. You can help out the animals by Donating to our Hospital Fundraiser today.